High performance new generation plasticiser admixture. Dosage: 0.3-1.1% over cement weight. Specially designed for use in prepared concrete plants and in civil works. Strong reduction of water: between 15 and 20% depending on the dosages used. Reduces permeability and penetration of water into concrete. Provides waterproofing properties to concrete. Minimizes shrinkage of the concrete by allowing it to work with lower water / cement ratios. Auramix 230 complies with standard UNE-EN 934-2: 2010 Table 2 as water reducer / plasticizer. Auramix 230 is a high-end multifunctional plasticizer based on synthetic polymers intended for the preparation of ready-mixed concrete with a high water-reducing power and dispersant of the cement particles. It maintains the workability of concrete longer than conventional plasticizers. Optimum dosing of Auramix 230 to achieve specific requirements should be determined by testing the materials and conditions under which it will be practiced. A starting point for such tests is to employ a dosage of 0.3-1.1 liters per 100 kg of cementitious material, including ash, slag or microsilica. The materials used and the processes of mixing and distribution. Auramix 230 is compatible with other Fosroc Euco additives used in the same concrete mix. If more than one additive is used, these must be added to the concrete separately and not mixed together before being added. The resulting properties of the concrete containing more than one additive should be checked by prior testing. 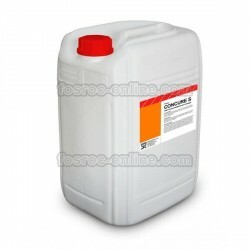 Auramix 230 is suitable for use with all cements complying with standard RC-08. The correct amount of Auramix 230 should be measured by a suitable doser. To obtain the best results, the additive should be added to the concrete in the kneading water or directly in the mixer at the same time as the water. Contact the Technical Department of Fosroc Euco to be advised on the proper dosing equipment and its installation. Auramix 230 spills should be absorbed with sand or earth and transferred to appropriate containers. The product residues should be sandblasting with large amounts of water. Disposal of the product and packaging is the responsibility of the end user. Auramix 230 has a storage period of 12 months if kept in a dry place and in its original containers and closed at a temperature of between 2 ° C and 40 ° C.
Auramix 230 should not be ingested or put into contact with skin and eyes. Wear protective gloves and goggles. Splashes on the skin should be removed with water. In case of contact with eyes, rinse immediately with plenty of water and seek medical advice. If swallowed, seek medical advice immediately. Do not induce vomiting. Auramix 230 is not flammable.